It’s Saturday morning and it’s cloudy and damp with a slight mist hanging in the air. I find myself traveling south of downtown Dallas, along Interstate 45, with Ennis, Texas as my destination. Why? Simple really. Ennis’ atmosphere is reminiscent of a little country town, population 16,045, with a down home feeling. 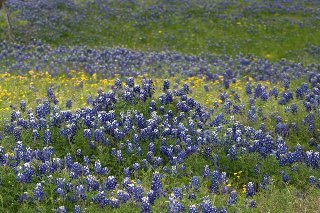 Bluebonnet gazing, a popular spring pastime, makes Ennis a great side trip destination for the whole family. Thousands of visitors make this annual trek, some having made visiting Ennis a family tradition. A strategically placed banner hangs high, welcoming each guest. Following the parade of vehicles down to Main Street, you may hear the faint strains of a polka melody filling the air. Peruse the many booths filled with handmade items. Visit some of the antique shops that line the thoroughfare. Be tantalized by the aroma of home baked goodies like fudge and freshly roasted peanuts…or take the kids on a pony ride. Housed in a huge white tent, the “visitor’s center” is where you pick up a map as well as written directions and a little history for the bluebonnet trails. Take snapshots, picnic or just relax and commune with nature while fields carpeted in deep blue and ablaze with splashes of orange wait to tease your senses. 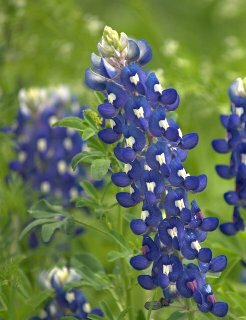 The bluebonnet season starts April 1st and runs until April 30th. The festival is generally the 3rd weekend of the month and it is advised that visitors check for the best time to visit. Flowers vary from year to year due to weather, terrain, and the peak time of the flowers. For the latest information, contact Ennis Convention and Visitors Bureau at 972-878-4748 or visit their website.